Inspired by His Love for Streetwear, Hip-hop and Japanese Traditions. Motofumi “Poggy” Kogi is an international king of style. Fusing streetwear, hip-hop and Japanese bespoke classic traditions, Poggy is refined yet eclectic, an icon #ForAllTime. Teaming up with PUMA to celebrate the 50th anniversary of the Suede, Poggy brings his unique aesthetic to the classic silhouette with a touch of Japanese traditional element. Poggy’s style is never bound by time or trends. His expertise of combining various genres with an overwhelming sense of design and deep meaning has attracted global attention to his work. He has also served as the director of Japan’s most influential fashion boutique UNITED ARROWS & SONS. 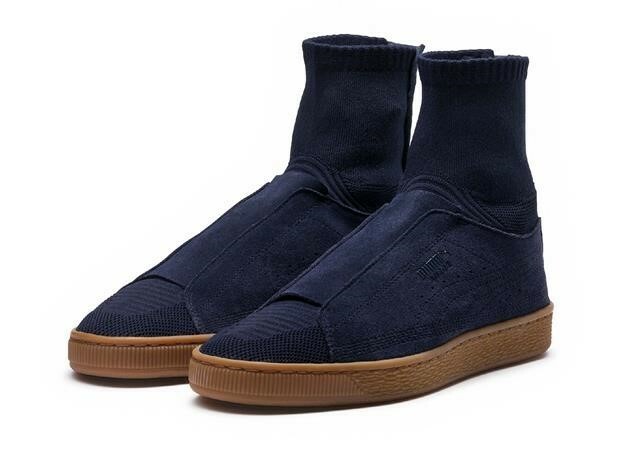 Poggy reimagines the Suede in the tradition of Japanese tabi socks but still retaining its hip-hop roots. A fully knitted indigo blue sock with Suede panels on the side and elastic band on the forefoot sit atop a textured gum sole. He went beyond and refreshed the Suede’s standard closure system with a Kohaze, a traditional Japanese hook, making it look more streamlined and sleek. And what is a collaboration with Poggy without a track suit? The black T7 full-zip track jacket with matching T7 track pants give off retro vibes with indigo blue panels and the signature 7-cm stripes which is woven by “Sashiko” (Japanese traditional needlework technology). Pants are pleated with a high rib cuff and zipper openings. The pack comes full circle with a PUMA x POGGY tee logo tee which is minimal and classic. Get the Suede 50: PUMA x POGGYTHEMAN capsule collection on PUMA.com and leading retailers September 15th.